Ford Motor Co., widely recognized as the maker of America’s best-selling pickup truck, may not be the first automaker that comes to mind when thinking about cutting-edge transportation technology. But now that's starting to change. CEO Mark Fields emphasized at CES this week that Ford is going all-in on a new two-part strategy: to continue making and selling popular vehicles while ramping up investments in intelligent mobility services. “We are completely rethinking how we approach the business, with one foot in today, and one foot in tomorrow,” said Fields. To that end, Ford announced this week that it’s working to pair its SYNC in-car technology platform with Amazon’s Echo smart speaker and Alexa virtual assistant, as well as the Wink home automation system. 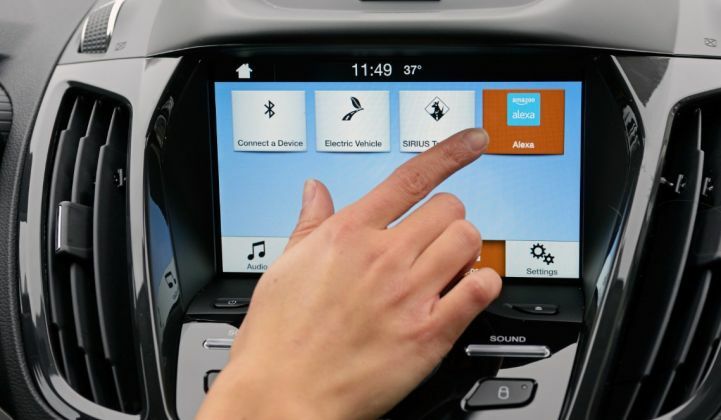 By connecting to these platforms, Ford vehicle owners will be able to voice-control their car and their home, as well as internet-connected devices like lights, TVs and thermostats. Ford gave the example of an electric-vehicle owner speaking to the Echo to find out how much electric range they have remaining. The voice control system is so seamless that it’s actually a little creepy. Ford has yet to announce a timeline for when these services will be fully integrated, but there’s good reason to move quickly. There are already more than 15 million SYNC-equipped vehicles around the world today and 43 million expected by 2020. Meanwhile, half of consumers say they plan to buy at least one smart home product in the next year, according to a survey by Icontrol Networks. Instead of a Google partnership, Ford announced that it will triple its fleet of fully autonomous cars this year from 10 to 30 -- which the company claims will be the largest self-driving vehicle fleet in the automotive industry. The cars will be equipped with next-generation sensor technology from Velodyne, and will be tested on roads in Michigan, Arizona and California. Ford announced several other initiatives this week as part of its new mobility strategy, including an expansion of its car-sharing service GoDrive, funding for a transportation technology competition, and a partnership with drone-maker DJI to improve drone-to-vehicle communications in emergency situations. These developments come on the heels of Ford’s recently announced plan to invest $4.5 billion in electric vehicles over the next five years. The funds will be used to add 13 new electric vehicles to Ford’s lineup over the same period, including the new Focus Electric, which boasts a 100-mile range. Ford’s strategic shift is grounded in major societal trends, said Fields, including urbanization, growth of the global middle class, increased pollution and associated health issues, and changing consumer behavior among millennials. “Any great business needs to try to predict the future,” said Fields. At the same time, the CEO underscored that Ford will continue to invest heavily in its core business of manufacturing, marketing and servicing cars, trucks and SUVs. Energy companies, most notably NRG Energy, have struggled to convince investors that they’re able to keep their existing business healthy while pursuing new opportunities. Fields acknowledged this is also a concern for automotive companies. “So it’s important for us to be deliberate, to communicate to our investors, to our employees, to our dealers, etc., about how we’re moving not from an old business to a new business, but to a bigger business,” he said in an interview. Today, the global auto industry totals about $2.3 trillion per year. Ford’s share of that is about 6 percent. The transportation services industry, which includes taxis, transit and rideshare, totals about $5.4 trillion and is expected to grow rapidly. And yet automakers like Ford receive almost no revenue from that sector. At the same time, it's about self-preservation. Automakers are sounding more and more like tech companies, with Google, Apple, Uber and Tesla poised to eat away at their existing market share. Why diversify Ford's business? “Very simply, it makes business sense,” said Fields. Ford’s $4.5 billion investment in electric vehicles is a significant part of the company’s overall strategic shift. Unlike other automakers, Ford did not create an EV from scratch. Instead, the company installed electrified platforms on its existing Focus and Fusion brands, and brought the C-Max design over from Europe. This strategy has served the company well. Last year, Ford sold more plug-in vehicles in the U.S. than any other auto brand, save for Tesla. By using pre-existing vehicle platforms, Ford has also been able to save money on manufacturing and training. The company also isn't locked into a big investment if EV sales flop. It’s a different approach from General Motors, which has invested heavily in developing a completely new EV platform to maximize performance. This week, GM launched the 200-mile-range Chevy Bolt at a $30,000 price point after incentives, upping the pressure to see a new and better product from Ford. Meanwhile, Google and Apple are already competing to offer services within the car, and could soon compete to sell cars as well. Layden said he welcomes Silicon Valley companies into the EV business. At the same time, he said it's hard to see how those companies could catch up to Ford.